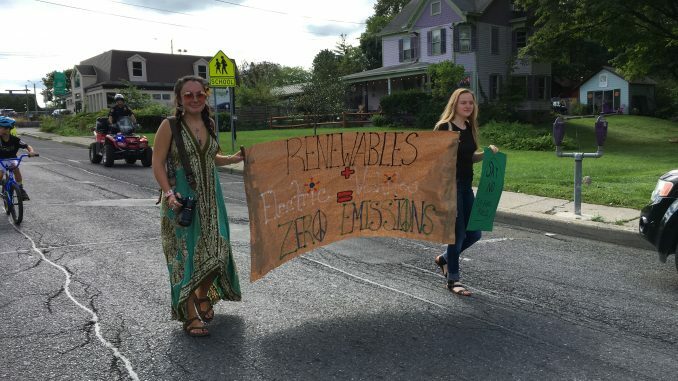 Just before 11 a.m. on Saturday, Sept. 15, people started to gather in the New Paltz Middle School parking lot for the first ever annual Zero Emissions Parade. The event was administered by New Paltz Climate Action Coalition, along with New Paltz Smart. The local Tin Horn Uprising played to get the crowd in the mood and children and adults alike rolled in with their bicycles and Teslas, Chevy Volts and Bolts, among other electric vehicles to show support. What started on South Manheim Blvd., led down Main Street and into the village.